Fascinating topic ... although linguists will tell you that Gaelic is actually quite boring in terms of its adverbial system. For example, Caucasian languages make a distinction of whether the object in question is higher, lower, or on the same level as you and whether it's visible or hidden from view. But I digress. What's the difference? The first line is definitely careful speech, the second normal/colloquial, and the third and fourth just colloquial variants. Slightly exaggerated but that's essentially the difference - thall is the space some way away from the speaker but with no specification of how far or where in location to the person addressed. A-bhos is similarly vague, so they often get translated "by over here, hereabouts" and "over there, thereabouts". You can combine them to emphasise the "over here" or "over there" bit: a-bhos an-seo, thall an-siud, thall an-sin. 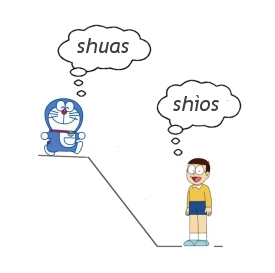 Shuas [huəs] and shìos [hiəs] are simply adverbs of location - nobody is moving. And fun get's even better - you have to watch out whether a movement is away from the speaker or towards him. If you're downstairs, and your cat is running up the stairs trying to get away from you, she is going suas [suəs]. If you're standing on top of the stairs and Tiddles is zooming up the stairs, towards you, she is coming a-nìos [əˈniəs]. And the other way round - if you're at the top of the stairs and your cat is running away from you, down the stairs, she is going sìos [ʃiəs]. But, if you're at the bottom of the stairs and Tiddles is falling down the stairs towards you, she is coming a-nuas [əˈnuəs]. 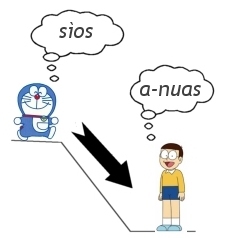 Confusingly, some dialects have merged a-nuas and a-nìos into a-nuas, in which case a-nuas stands for 'movement towards you either upwards or downwards'. It may help to think of them as *an-shìos and *an-shuas, from below and from above, which is where these words originally come from. That's also the reason why the n at the beginning of a-nuas and a-nìos are weak as if they were word medial or final - because they originally were stuck at the end of an-. Pronounced a-nall [əˈnãũL] and a-null [əˈnũːL]. Assuming that, as explained above, a-bhos and thall are considered "fuzzy" concepts. A-nunn [əˈnũːN], which you will sometimes see is just a variant of a-null. Err ... not quite, as we've had a question about a-bhàn "down" (motion) and an-àird "up" (motion). This used to be a question of Mainland dialects (which used a-bhàn and an-àird) and Island Dialects (which use the above system). Today it's a stylistic question - a-bhàn and an-àird definitely being the marked terms. A "marked term" means that it's less common and sounds something between off and posh when you use one, although an-àird is more acceptable than a-bhàn. Air a tharraing à "http://akerbeltz.org/index.php?title=Adverbs_or_Thall_%27s_a-bhos&oldid=2139"
Chaidh an duilleag seo a dheasachadh 13 dhen t-Sultain 2013 aig 05:00 turas mu dheireadh.